The 1201 Third Avenue Tower (previously known as the Washington Mutual Tower) is the second tallest skyscraper in the downtown Seattle skyline. At 55 stories and 235 metres (771 ft), it is the eighth tallest skyscraper on the West Coast. Construction began in 1986 and finished in 1988. It was designed by Kohn Pedersen Fox Associates and The McKinley Architects. 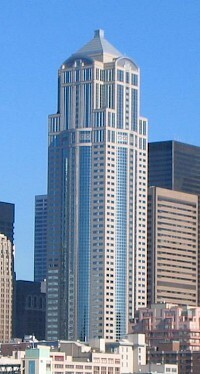 Wells Fargo Center is a 573ft (175m) tall skyscraper in Seattle, Washington. 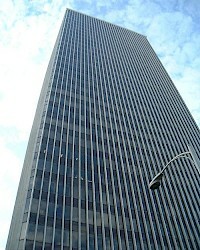 It was completed in 1983 as the First Interstate Center and has 47 floors. It is the 9th tallest building in the city. The 87,386 m² was designed by McKinley Architects and owned by Equity Office Properties Trust, and has 24 elevators. The exterior façade is composed of a six-sided, steel-framed tower that features a combination of tinted continuous double-glazed glass and polished spring rose granite panels. The Westin Building is a major telecommunications hub and carrier hotel facility located in downtown Seattle, Washington.. The building is also home to the Seattle Internet Exchange (SIX) and Pacific Northwest Gigapop's Pacific Wave Exchange. The facility has a pair of "Meet-me Rooms" on the 19th floor, which are used by telecommunication carriers and internet service providers to cross-connect their individual networks.